The Excelsior™ Collection evokes feelings of old-world majesty and grandeur. Excelsior™ is as durable as it is beautiful. The hinged doors with distinctive filigree detail and mirrored back create a unique look with lasting style. With a rich, dark Fruitwood finish, elaborate woodcarvings, and intricate medallion door pulls, this collection is truly one-of-a-kind. 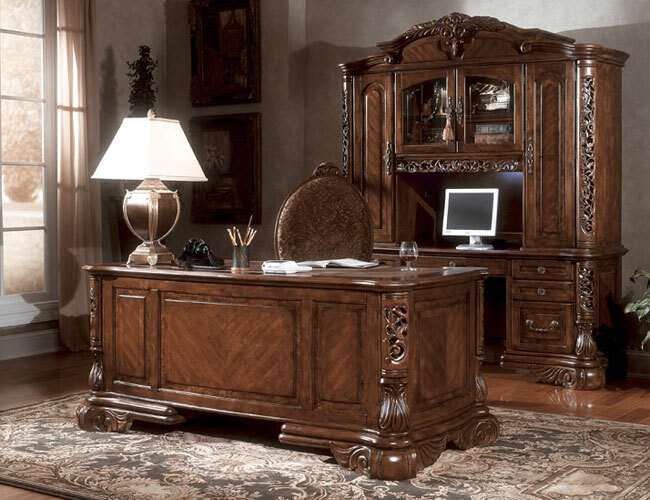 Home Office Credenza w/ Hutch Item#: 59205-6-47 Dimension: H86.50" L70.00" D24.00"
Item#: 59209-10-47 Dimension: H92.00" L41.50" D22.50"